Pushkin's unexpected nonrhymes and rhymes consitute an important part of his poetics of the unexpected; however, hitherto they have never been studied in any detail, and, indeed have only rarely been even touched upon. This study analyzes individually all the instances of unexpected nonrhymes of Pushkin's completed rhymed poetry (with the exception of Evgenii Onegin), and all the instances of unexpected rhymes in the completed nonrhymed poetry, as found in the basic texts in "large Academy" textual editions (with variants) of 1937-59, and published in Shaw's Pushkin's Rhymes: A Dictionary (1974). ("Completed poems" are those that Pushkin published or tried or wished to publish, and thus show that he was willing for the public to judge his artistry by them.) Emphasis in this study is on the final text, but the study of the variants shows in detail that Pushkin's unexpected nonrhymes and rhymes are by no means the result of carelesness or negligence. Each poetic "imperfection" of this kind has an artistic function to fulfill; some of the most effective of them were introduced during final revisions in the publication process. This study fills an important gap in studies of Pushkin's poetry and poetics. It should be of interest and importance to almost everybody who reads Pushkin's poetry in Russian, from the professional Pushkinist to the beginning graduate (or undergraduate) student of Russian literature who may be reading any of these poems in Russian for the first time. The unexpected nonrhymes are in some of Pushkin's most famous rhymed poems, written throughout his mature period: in eight of the completed long narratives (poemy and povesti v stikhakh), and in fifteen lyrics; everyone who is at all interested in Russian literature knows almost every one of them. In Chapters 1 and 2 they are categorized by artistic function and individually analyzed. One surprise in the categorization is that the "open end" is used in a surprisingly small proportion of these poems. The preponderance of the lyrics with unexpected nonrhyme are "completed fragments" that abruptly conclude with surprisingly varied types of the figure of expressive silence. For each of these nonrhymed endwords there is also consideration of sound repetitions in the poetic context. The analyses show that for these words Pushkin uses sound repetitions quite differently for the rhyme-element than elsewhere in the immediate poetic context, so that the rhyme-sounds stand out. The unexpected rhymes appear in two different kinds of nonrhymed verse: (1) imitations of Russian folk poetry (two song cycles and one nonrhymed folk-style tale), and (2) the nonrhymed dramas. 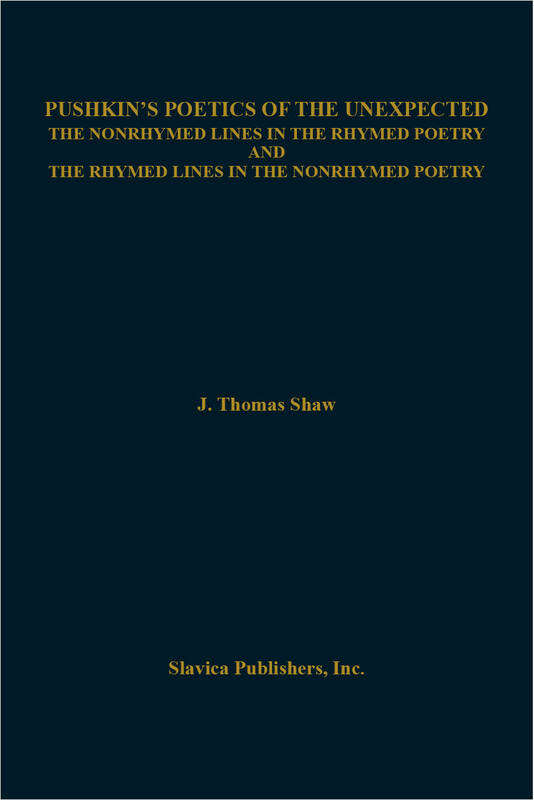 The occasional rhyming in his poems imitating folk poetics (Chapter 3) is characterized by repetend rhyming, by extensive use of near-rhyme, and by conscious use of sporadic medial-and-endword rhyme--something Pushkin never has in his "literary" poems. In a prosescene of Boris Godunov (Chapter 4), Pushkin uses for dramatic purposes another Russian folk verse type: Varlaam's dialogue is peppered with vigorous, pithy rhymed phrases in "spoken verse" (skazovyi stikh). In the nonrhymed verse of Boris Godunov, Pushkin follows the example of Shakespeare in having unexpected occasional rhymes. For Polish "local color," Pushkin took from Romeo and Juliet the ball scene, epitomized by the dramatic use of a (camouflaged) sonnet and for a rhymed exit at scene-end (Chapter 5); like Shakespeare, Pushkin also has incidental rhyming in a number of the other scenes, especially when a character attempts to be persuasive (Chapter 6). In the first of the Little Tragedies (Chapter 7), The Covetous Knight (Skupoi rytsar'), Pushkin similarly uses Shakespeare's The Merchant of Venice for repetend rhyming (and significant subtext). Among the occasional rhymes in Mozart and Salieri and The Stone Guest there are further examples of repetend (and near-repetend) rhymes. Nevertheless, Pushkin's use of occasional rhymes is quite different from Shakespeare's, especially in having "quatrains" in which one pair has rhyme but another has near-rhyme (by Pushkin's standards), and in the use of an unexpected rhymed passage with its climax in nonrhyme (for example, Shuiskii's rhymed passage preceding his revealing the name "stolen" by the Pretender). Every chapter of this study breaks new ground, either by treating subjects completely new to scholarship, or by giving treatment to topics that have been barely touched on before.